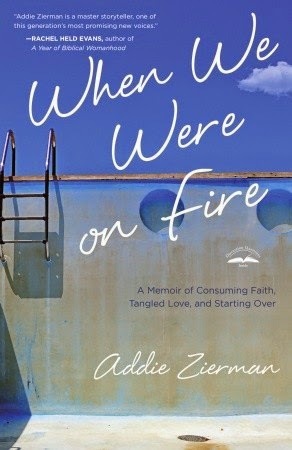 I was thrilled when I received When We Were on Fire by Addie Zierman. This book has been on my "to read" list since it released. You see, I love a good memoir. Addie's sweet story is a book that chronicles her coming of age. From zealous teen, to jaded young adult, and back to the heart of faith. Addie's journey hits it's stride during the years where Christian culture seemed more about what you were listening to, wearing, or avoiding and less about who you actually were in Christ. With it's emphasis on looking right and avoiding the masses (or at least offering a Christian alternative), it was a prime time to set up a young girl for heartbreak, failure, and hope. My favorite aspect of When We Were on Fire is the idea of relationship and community. Addie's story isn't extraordinarily remarkable, but that is what makes it special. She is relatable. She is honest. She is brave to share her story. Thank you so much for reviewing this book. I'm dying to read it!! I love this kind of memoir, too.